Baby Todd is currently in the CICU (Cardiac Intensive Care Unit) awaiting his surgery. He has several IV's and monitors attached to him. The Doctor and nurses are currently monitoring his head and body's oxygen levels, body temperature, blood pressure, pulse and chest movements. He has IV's in his left hand and in his umbilical cord. The clear, plastic box 'thing' is his air hood. 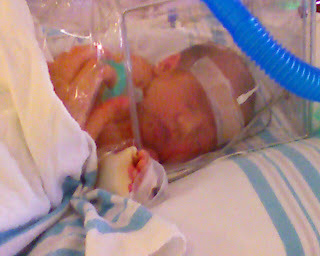 It is used to manipulate and regulate the air that Baby Todd is breathing. We got to go sit with Baby Todd this morning for about an hour. As of right now, that was the only time we got to be with him today. There has been a lot of activity in the CICU today, so we were not permitted in to visit this afternoon or evening. During our visit this morning Baby Todd was a bit restless. So I got to hold his hand, underneath his breathing hood. The nurses have been giving him his pacifier dipped in sugar water, to help soothe him.